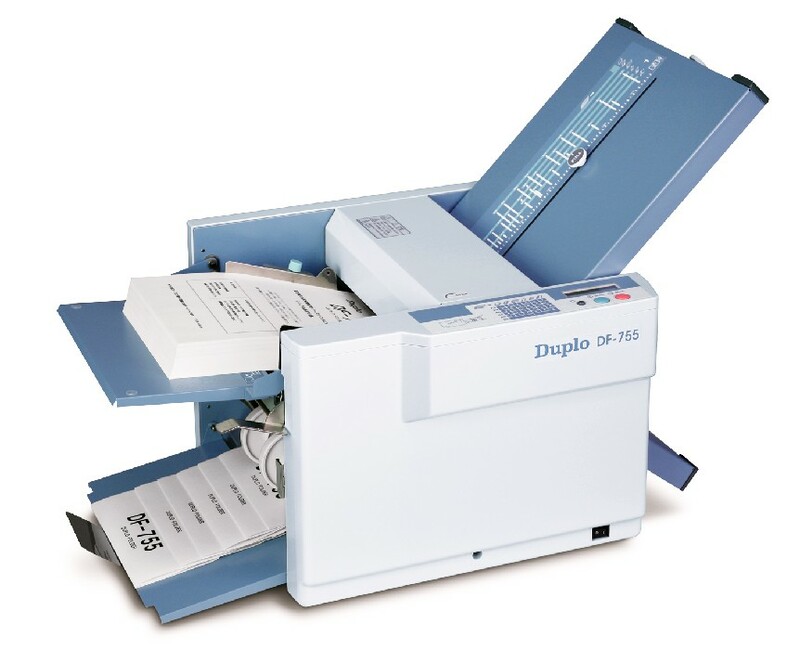 The Duplo DF-755 is a user-friendly, manual-setting paper folding machine which folds documents at up to 120 sheets per minute. Whether the application is a letter, flyer, brochure or billing statement, set up is simple. Two easy-to-follow charts indicate where to position each fold stopper for six popular folds. For non-standard paper sizes and custom folds, adjustments knobs enable the user to make minor adjustments to achieve the desired fold. A 4-digit LCD counter and a 500-sheet feed tray capacity ensure non-stop folding. A tray tension control makes feeding a wide range of stock up to 80 lb. quick and easy. Additionally, the DF-755 paper folder is capable of cross folding with no additional parts or adjustments required. The DF-755 is ideal for any office environment, school, or church.